The five-reel twenty-line Dogfather video slot is all about a dog dynasty gang that keeps neighborhood in fear. Infiltrate the cruel animal outlaws and try to grab a generous money loot. In this wonderful slot machine, you will come across mafia dog symbols, knuckle duster, cigar, stuffed bunny, revolver, etc. Before you spin the reels, enable any number of paylines by betting up to five coins on each. A coin denomination starts at $0.01 and reaches $0.5. 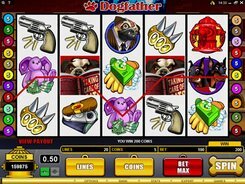 The Dogfather symbol is a wild yielding a whopping 13,000 coins for five of them on any active payline. Besides, a wild can stand in for other regular icons to finish a winning combination. Three or more Itchy Da Flea symbols scattered anywhere activate thirteen free games with a x3 multiplier attached. Another bonus game is started by 3+ Fire Hydrant scatter symbols. In this bonus feature you’ll help a dog mark his territory by picking hydrants to get away with up to 5300 coins in your pocket.